Easter, the most holy of all Christian holidays, is celebrated with special services all over the world. Some of these Easter services may even inspire you to plan a pilgrimage. The Salem Congregation Sunrise Service is the oldest continuous Easter sunrise service in America. It was first held in 1772, in the same manner Moravian churches held the service in Germany since 1732. Now, 245 years later, people come from all over the world to experience Easter sunrise in Winston-Salem. The Church Band, which is made up of around 100 members from all 13 churches of the Salem Congregation of Moravian churches, is used for all outdoor services such as funerals. It assembles at midnight for a breakfast, and then at 2 a.m. they march through the city playing hymns to begin Easter Sunday and to wake everyone for the service. This year's service will begin at 6 a.m. outside the Home Moravian Church for a procession to the Salem Moravian Graveyard, known as God's Acre. The service will be live-streamed at WSJS.com. Easter, the feast of feasts, is celebrated with special solemnity. The church is filled with fragrance of incense and myriads of lights. The clergy are arrayed in their best vestments. All the people hold lighted tapers. Greetings are exchanged, drums are beaten, hands are clapped and singing is heard everywhere: "our resurrection has come, hosanna." Men are heard saying "O Lord Christ have mercy upon us." They pray for a blessing, "O God make it to be a festival of our good fortune and of our well being! Let us have another threshing floor and another year if thou wilt." See an Easter service at the Ethiopian Orthodox Tewahedo Church in Washington, D.C. here. The Cathedral of Christ the Saviour in Moscow is the tallest Orthodox church in the world. Patriarch Kirill, head of all the Russian Orthodox Church, presides over the Easter (Pascha) midnight mass. He begins the mass wearing white vestments, but changes to red before the end of the mass. See pictures from the Easter liturgy here. 4. LINCOLN MEMORIAL SUNRISE SERVICE // WASHINGTON, D.C.
For the past 39 years, the Capital Church of Vienna, Virginia, has led the Easter Sunrise Service at the Lincoln Memorial in Washington, D.C. This year's service will begin at 6:30 a.m., and the interdenominational event is expected to draw several thousand people. The spectacular view of the sunrise over the Washington Monument is definitely a reason to wake up for the early-morning service. At the Cathedral of Saint Mary of the Flower (or simply the Duomo, as it's commonly known), Easter mass goes out with a bang. The tradition goes back to the Crusades when three flint stones were brought back to Florence from the Holy Sepulchre. They were used to spark the symbolic new fire at Easter, which is distributed to parishioners for their homes. The cart that carried the fire became more elaborate and was eventually loaded with explosives so that the holy fire would create real fireworks. This became known as Scoppio del Carro, or "explosion of the cart." The parish's love of fireworks entered the Easter morning mass itself in the 16th century when the church began using a rocket, shaped like a dove, as a visual aid to symbolize peace and the Holy Spirit. The holy fire is used to ignite the dove, which travels down a wire from the choir loft to the square outside and ignites the fire delivery cart. The fireworks display lasts for about 20 minutes. The Holy Resurrection Cathedral is an Orthodox Church in Tokyo, informally called Nikolai-do after its founder, St. Nicholas Kasatkin. The Easter mass at the cathedral begins Saturday 30 minutes before midnight and runs until about 4 a.m. During that time, the lighting in the cathedral is changed from dark purple to bright white, signifying the resurrection. Food that was eschewed during Lent is brought in to be blessed before the feast that breaks the fast on Easter Sunday. Blessings are given in dozens of languages. In 1944, a Methodist church took their youth group to the top of Stone Mountain to watch the sunrise on Easter morning, and a tradition was born. Now the Stone Mountain Sunrise Association conducts an Easter sunrise service every year for thousands of people. The Skyride lift begins operation three hours before the service, and anyone who decides to hike instead is urged to bring flashlights and allow plenty of time. For those who wish to remain at a lower elevation (or don't arrive early enough), a second service at the base of the mountain is held at the same time. San Agustin, a Roman Catholic church in Manila, celebrates Easter with a midnight mass featuring the Salúbong, a pageant that recreates the joyful meeting of Jesus and his mother, Mary, after the resurrection. The drama begins with the procession of statues and includes music and dance. The Salúbong is performed as the sun rises on Easter morning and signifies the end of Holy Week rituals. Formed in 1910, the Zion Christian Church has between five and eight million members. It is notably one of the largest African-initiated churches, meaning it was not founded by missionaries. The Easter celebration at the church's headquarters in Moria is the largest Christian gathering in South Africa, as millions of ZCC congregants travel to Moria for their annual pilgrimage. The Easter service, which is held outside, is full of music from brass bands and choirs, and includes group dancing and a sermon from the ZCC bishop, currently Bishop Barnabus Lekganyane of the St. Engenas Zion Christian Church. The Church of the Holy Sepulchre is built over the area identified as Golgotha, where the crucifixion of Jesus took place. Today, the church is under the shared custody of several different Christian sects. 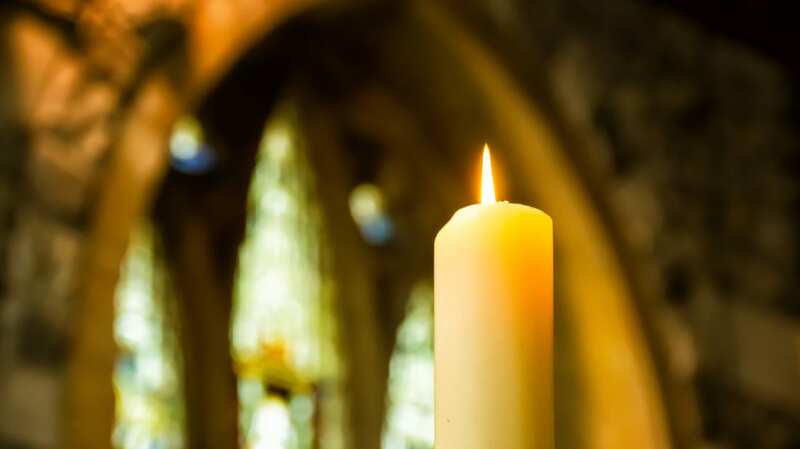 The Catholic Easter Vigil service begins on Saturday morning with a Latin liturgy and lasts through to early Sunday. In reality, there are breaks in the service, as Orthodox Christians will be celebrating Easter on the same date and using the church for their Holy Fire ceremony Saturday evening. According to the Orthodox tradition, a blue flame emanates from the tomb of Jesus, which the Patriarch uses to light candles. The fire is then passed to candles held by attendees, who take the holy flame home to places around the world. See pictures of the church's many Holy Week events here. Protestant Christians, who are not represented among the custodians of the Church of the Holy Sepulchre, often celebrate Easter in Jerusalem at the Garden Tomb, an alternative site considered by some to be the tomb of Jesus. The outdoor garden hosts several Resurrection services: an Arabic service Saturday at 4 p.m., two English services on Sunday at 6:30 and 9:30 a.m., and a Scandinavian service at 11 a.m. You can see pictures of the sunrise service here. So many people travel to Vatican City in Rome for Easter that services are moved from St. Peter's Basilica to the square outside. Pope Francis has a full schedule of masses and blessings during Holy Week, culminating in the biggest crowds for the Easter Vigil and Easter morning mass. The Easter Vigil begins at 8:30 p.m. Saturday, Easter Mass is at 10:15 a.m. Sunday, and there will also be a blessing at noon. St. Peter's Square can hold up to 80,000 people (though crowds lining the streets in the past have been estimated to be as big as 150,000), but for an Easter service, you'll need to reserve tickets well in advance.